Please fill out the online employment application! You never know when a position will open up. Firstly, Ryan Amusements is always looking for mature, honest, enthusiastic employees with excellent customer service skills. In addition, we offer a friendly, fun working environment. Our employment opportunities are available for full time and part time positions. Also, you must be willing to work nights and weekends. So, if you are interested in joining our team, please complete the following online employment application. And, refer to the position you are interested in. We will be in touch with you soon! For further information, please find your location and contact us! Please fill out our Online Application and refer to which position you are interested in. 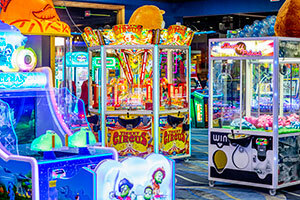 Why Do You Think You’d Enjoy Working for Ryan Amusements? Unless otherwise noted, I authorize Ryan Amusements or its agent to investigate and/or verify all information in this application, including contacting all persons, schools, current employer (if applicable), previous employers and other individuals or entities named herein (and those named on accompanying resume, if any). I hereby authorize my former employers and other third parties named on this application to release information pertaining to my work record, habits and performances. In doing so, I hereby release them and Ryan Amusements and its agents from all liability which may flow from the release of such information. Ryan Amusements is an equal opportunity employer. All qualified applicants will receive consideration for employment without regard to race, color, religious creed, retaliation, national origin, ancestry, sexual orientation, gender, mental or physical disability, genetic information, and choice of health insurance, marital status, age, veteran status or any other basis protected by law. Additional testing of job-related skills, as well as post-offer pre-employment physical and or a drug test may be required. Any offer of employment at Ryan Amusements is contingent upon the results of a post-offer/pre-employment physical and drug screen. If you cannot pass a drug test, please do not apply.